Butler Manufacturing | JG Bowers, Inc.
A building’s roof is like a suit of armor. Taking over 90% of the yearly wear and tear, the roof safeguards your building’s valuable internals: products, equipment, tooling and personnel. It endures regular onslaughts from rain and snow, heat and cold. Like armor, roofs, too, can become damaged. They can suffer blows that threaten their integrity. And, like armor, when a roof failure occurs, the cost can be catastrophic. In light of this, investing in a rock-solid, proven roofing system – like Butler’s MR-24 system – is an investment in your building’s livelihood. In this post, we’re going to examine the strengths of the MR-24 roof system and, more importantly, discuss how those strengths work together to defend your building against the elements. 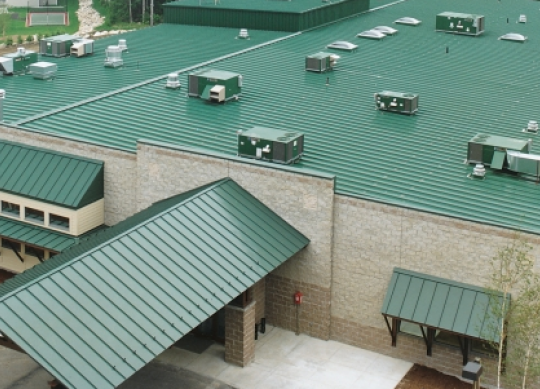 Offering up to four times the lifespan of rubber roofing, metal roofs are the most durable on the market. With the MR-24 system’s full metal construction, there have been cases where it has been documented to last over thirty years. Utilizing the fewest penetrations possible, the MR-24 roof system is held in place by a special tool called a “no-clip seamer.” This ensures a weathertight, waterproof roof assembly that is able to expand and contract as temperatures and weather conditions change. Boasting the longest life – as well as the lowest maintenance and lifecycle costs – of any roofing system available, the MR-24 system is the most reliable system available. When you want to protect your building, its contents and your company’s bottom line, there is simply no better option. At JGBowers, Inc., we believe that our customers want – and deserve – the best. As a result, we’ve partnered with Butler Manufacturing because they have continually proven their dedication to offering the best long-term roofing solutions in the industry. If you’ve been weighing your options or have considered having a new roof installed on your building, contact us to discuss how you can save money – and heartache – with the MR-24 roof system.